I love to entertain, especially for cocktail parties with a table full of appetizers. Hors d’oeuveres are often underrated. As a kid my favorite part of holiday dinners was the array of pre-dinner snacks that different guest contributed, from my aunts vegetable trays (with the best Ranch dip ever) to my oma’s crab dip. Still to this day my favorite thing to do when going out to dinner is to order a bunch of starters. So many of the traditional appetizers that I loved are filled with dairy, eggs and meat. It has been a fun challenge to recreate some of the favorites of my past. I always loved my stuffed mushroom filled to the rim with cheese and these have the same satisfying flavor. Preheat oven to 350 degrees. Saute onions and garlic in olive oil. Add ingredients from basil to italian sausage and ten mushroom stems. Saute for 5 more minutes. In a food processor or blender add onion mix and ingredients from nutritional yeast to cream cheese. Blend until creamy. Stuff mushrooms. Sprinkle tops with bread crumbs. Bake 15 to 20 minutes until mushrooms begin to get soft but still firm. Gallery | This entry was posted in appetizer. Bookmark the permalink. 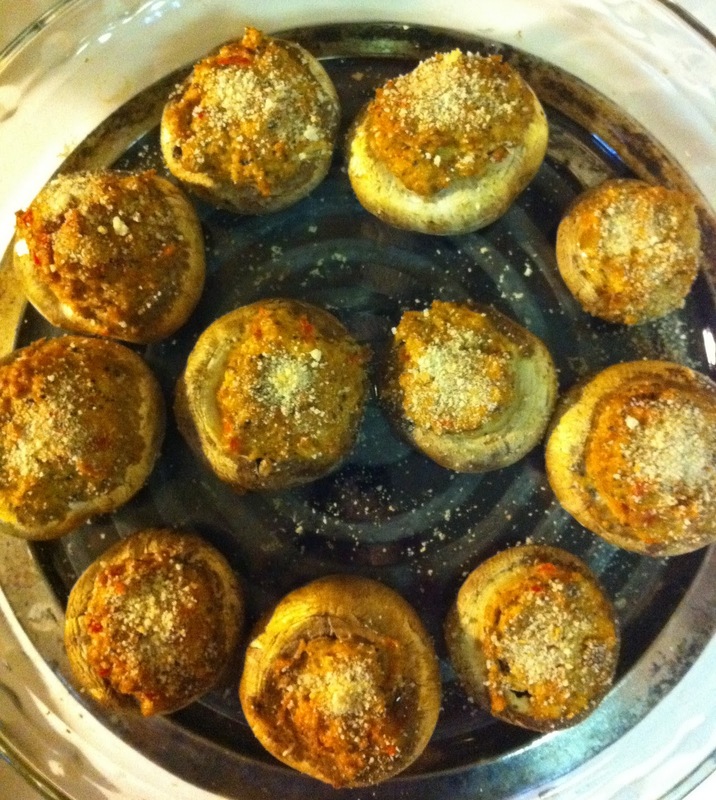 >Mmmm I have been craving stuffed mushrooms for a while, I will definitely have to try this recipe out! >Cool Kelsi! I hope you enjoy them as much as we did.